The AT4051a is a pencil condenser mic that accepts multiple interchangeable capsules, all of which are externally-biased (true) condenser designs. The preamplifier body is p/n AT4900a-48; it is a phantom-powered, low noise, transformerless output design with integrated pad (-10dB) and high-pass filter (-12dB/octave @ 80Hz) switches. It ships in a padded plastic case with a mic clip and foam windscreen. 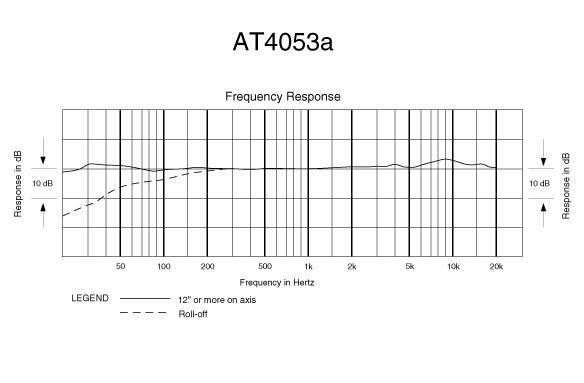 The AT4051a really impressed me when used as a close-mic on acoustic guitar. It seemed to have all the body of the warmer Neumann and Schoeps models, with the added benefit of a perfectly defined high-end sparkle. At a distance, it took on a smoother and more neutral character not unlike the Schoeps, but retained its characteristic warmth and presence. The mic was revised in 2008; see the AT4051b for details on what changed.